What Was Beautiful, (installation view, Daum Museum of Contemporary Art), mixed media, 8 framed works, 24 inches by 48 inches each, 2007-2014. What Was Beautiful, (installation view, Sherry Leedy Contemporary Art), mixed media, 8 framed works, 24 inches by 48 inches each, 2007-2014. 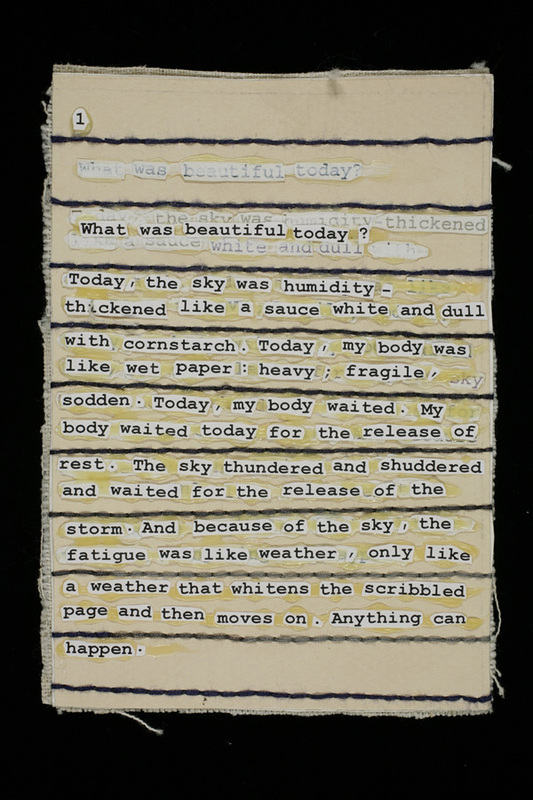 What Was Beautiful, (detail), mixed media, 8 framed works, 24 inches by 48 inches each, 2007-2014. Below: What Was Beautiful #1-365, mixed media, 365 embroidered, painted and collaged rectangles of paper, each piece 3 inches by 5 inches, 2007-2014.